Imagine white sand beaches set against the backdrop of emerald and turquoise waters! 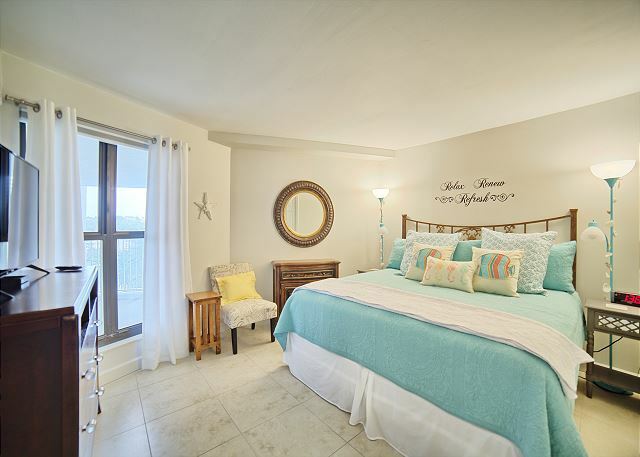 This spacious 1BR/1BA condo located gulf front on the 4th floor of Beachside II offers breathtaking views of the Emerald Coast. The decor is tastefully done in tranquil colors popular along the coast, setting the stage for a fabulous vacation! The open design kitchen allows conversation with familly/friends during meal prep while gazing out at the gulf. There are also grills located near pool area. After a day in the sun enjoy a restful night's sleep as accommodations include a king sized bed plus queen sleeper sofa. Owner's are very attentive to guests' needs. After 2nd negative review of foam mattress owners replaced it with new spring mattress. They also purchased a new sleep sofa & love seat. All delivered the week of 5/20/18. The bathroom has been updated with natural colored decorative tile & a gorgeous walk in shower. Beachside II pool is heated in spring. From the pool there is direct access to the beach via private boardwalk. There are beach chairs & an umbrella in the condo for your use or you can rent them on the beach if you choose. Tram Access is included for transportation to The Village of Baytowne™. Whatever you desire in a vacation, this resort offers it all! For the golfer, there are 4 championship golf courses. For the fitness buff there are 11 miles of paved pathways for bicycling or jogging, 14 tennis courts, basketball courts and an on-site fitness center. The 98 slip Marina will satisfy the water sports enthusiast with kayak & jet ski rentals. Climb aboard the Solaris for an extraordinary evening of live entertainment & fine dining set against the backdrop of a picturesque sunset & shimmering waters. Shoppers will delight in the variety of specialty boutiques available at The Village of Baytowne, Grand Blvd or searching for bargains at Silver Sands Outlet Mall. For those in need of a little rejuvenation a full service spa is available for pampering. Children of all ages will be delighted whether choosing activities of self discovery or joining in the fun at planned kids activities. Nature paths, rock climbing, water slides, pirate ships, tree houses & their very own Jolee Island offer something for everyone. 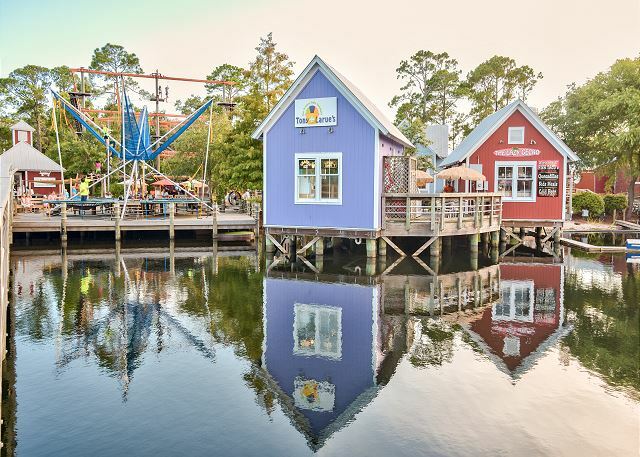 At the end of the day, The Village of Baytowne™ offers a variety of options for casual to fine dining and live entertainment whether relaxing at the pier or dancing the night away in a nightclub. So leave all your worries at home and discover why people return year after year to Sandestin Golf & Beach Resort. A VACATION WHERE MEMORIES ARE MADE! RESORT TRANSPORTATION PROVIDED WITH THIS RENTAL - Owner participates in the Sandtram resort-wide shuttle service. You will be able to use the shuttle during your stay at no additional charge. This service is NOT offered by all owners. If you feel transportation would enhance your vacation experience by not having to drive & deal with parking availability, you should seriously consider the advantage of renting this condo. DESTIN MEMORIES is an independent company that is not affiliated with, sponsored by or associated with any entity containing the word “Sandestin.” Any use or reference to the word “Sandestin” is used in the factual sense to geographically identify a property or location and not to suggest any affiliation with any SANDESTIN™ branded entity, product or service. Great Beach Condo - Beautiful Sunsets! This was the cleanest condo I've ever stayed in! It was very easy to book, and Denise was so nice and helpful. The app with info regarding the area was GREAT! Condo was beautifully furnished, had a really comfortable king bed, and the sleeper sofa was also comfortable with a memory foam mattress. Kitchen was well appointed, we had everything we needed to cook meals, even made a birthday cake for our daughter. Beach chairs & umbrella were a happy find. Bathroom was totally updated & clean. High top table on balcony was great for enjoying coffee in the mornings and Happy Hour sunsets! We love Sandestin and we loved this condo - will definitely be back!! Beautiful condo with full glass sliding doors looking out to the Gulf. Relaxed on the balcony and could work at the table and look at the beautiful life size aquarium for my daily view. Incredible. Beautiful Room. Meticulously maintained and well equipped for all your needs. Felt like home away from home but no worries... just relaxation. I would highly recommend for any time of year! was awesome and cleanest unit and best looking unit in 6 years. except the mattress needs to go because after three days the sinking affect of the mattress started creating a problem. please use a new cheaper mattress and not a used one from your house or wherever you may have gotten it. Overall a very clean, recently renovated and decorated, with an awesome view properly. Well appointed and modern kitchen that had everything and more that we needed to cook full meals. The bath is also very modern. Our only recommendation is a much needed new mattress and living room couch. We would not hesitate to return if the above mentioned were addressed.